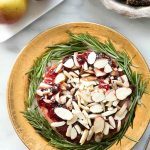 This easy recipe works well with any meal including holiday celebrations. 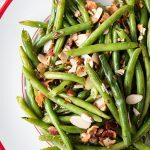 Fresh Green Beans with Bacon and Sliced Almonds have great flavor and crunch! Sometimes when sharing a recipe there isn’t a fascinating story behind it or a tutorial. It’s just plain good food. 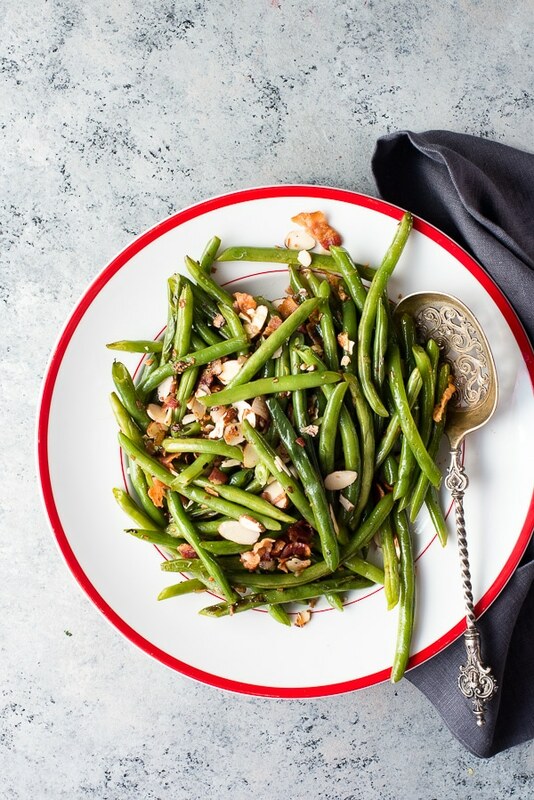 This Fresh Green Beans with Bacon and Sliced Almonds recipe is one of those. It’s just simple goodness! I think green beans were one of the first vegetables I became friendly with after beginning to cook for myself. While I was in college steaming and stir-frying were all we did it seems. It was quick, easy and kept things fresh tasting. I’d grown up on boiled or canned vegetables which really required major rehab regarding vegetable consumption. I loved that fresh steamed green beans had a crunch even when done and their flavor stayed true to the raw form. Unlike something like cauliflower which transforms into a completely different flavor and texture; like someone I didn’t know anymore. This recipe combines the ease of steaming with a bit more flavor. I remember my grandmother and mother having a tin can on their stove top with bacon drippings. They’d add a bit to different recipes for that fantastic flavor instead of the variety of oils home cooks use today. After the green beans are steamed they are sautéed in the same pan the bacon is cooked in (with a bit of the bacon fat). They are just finished in the pan along with cooked shallot, and tossed with the bacon bits and sliced almonds. 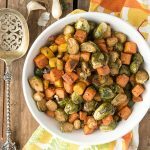 The recipe has wonderful flavor and crunch that my family absolutely loves. It’s perfect to accompany any meal and for holiday menus too (and for green bean casserole fans you’ll love this Haricot Vert and Mushroom Casserole). If you like the quick steaming (retains nutrients in the vegetables too) and then sauteeing you might love this Lemony Romanesco with Pine Nuts or Lemon Garlic Broccoli. 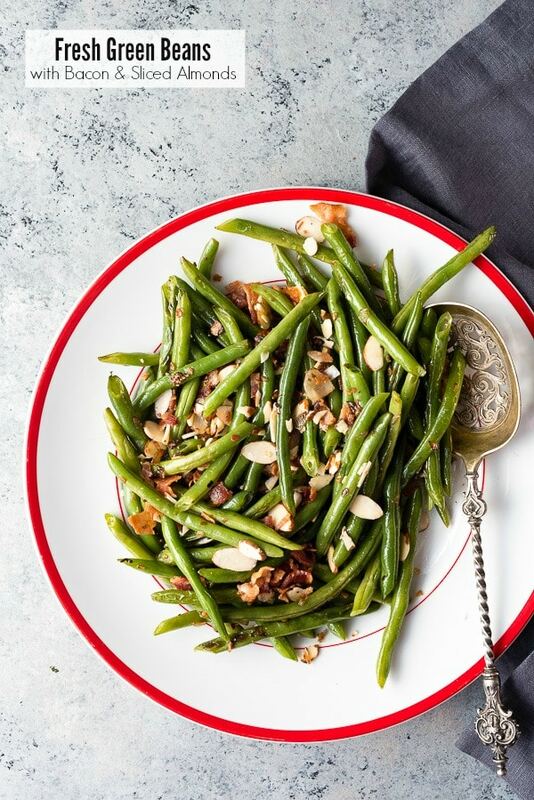 This quick and easy recipe for green beans combines steaming and a quick saute for ultimate flavor while still retaining nutrients. 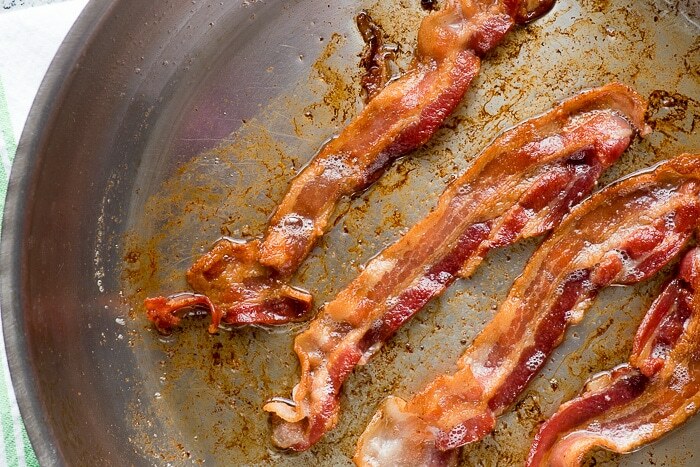 In a large skillet over medium-high heat, cook the bacon until done but not crisp. Remove the bacon to drain on paper towels. Reserve 2 teaspoons of the bacon fat in the pan and discard the rest. Chop or break bacon into small pieces. 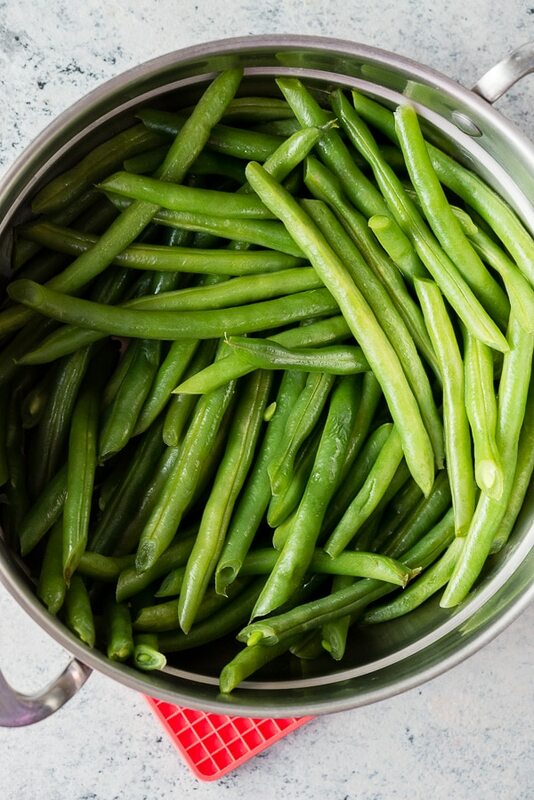 While the bacon is cooking, steam the prepared green beans using a steamer or steamer basket, until almost fully cooked 3-4 minutes (taste to test). Note: they will complete cooking when sautéed and to retain firmness they should not steam until fully done. 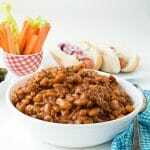 Remove beans from the steamer. Over medium-high heat add the diced shallots to the skillet with the bacon fat and sauté for 2-3 minutes. Add the green beans and sauté to coat and heat through. Toss in bacon and sliced almonds; remove from heat and serve immediately. This dish looks so yummy! I usually put almonds in our green beans but never thought of bacon, I will have to try! Great remix on the veggies! I love food with textures so the sliced almonds I am sure gave it an additional crunch! I am bookmarking this recipe for my dad. 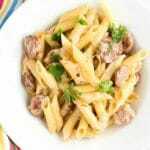 He is trying to stay away from the pasta and likes bacon dishes. green beans are my kids fav! i never tried it with bacon! gonna try it this week! 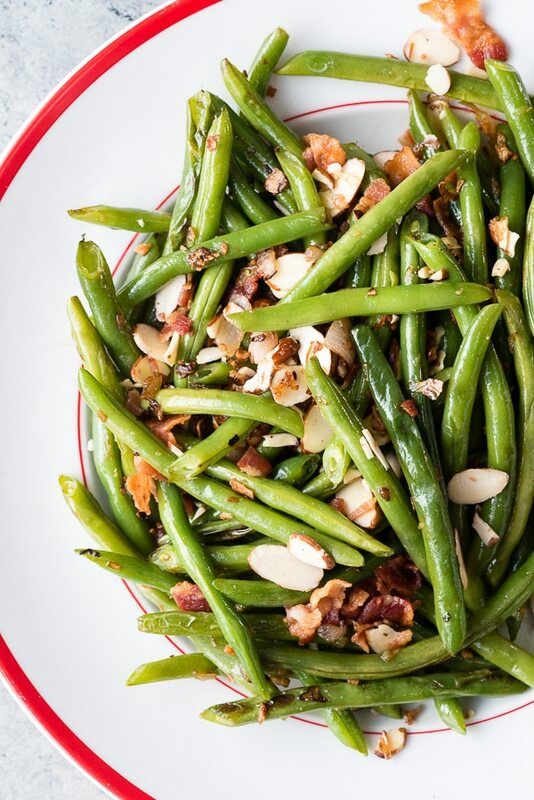 I am not really big on gree beans but you had me at bacon and sliced almonds! I could finish a huge service of this dish. It would go great with grilled chicken or pork chops! Veggies make me really happy. Almost as happy as bacon. Can’t wait to try these two things together. This looks delicious. I love green beans, so I’m sure I’ll love this. I love that it has a few things added for that crunch. Yum! Green beans are one of our favorites. I will have to get the ingredients I need to make some this weekend. These look so delicious and easy to make. I love green beans and you can never go wrong with bacon. Such a simple dish to prepare with so much flavor. These green beans look amazing! I am going to have to try this soon. This looks totally delicious! I love that you added almonds too! I love a crunch factor. I am a huge fan of green beans but have not had them fresh in a while. These lok like a such a great side. I think we’d love green beans prepared this way. I’m definitely curious to see how the bacon flavor works with the green beans. Green beans are one of my favorite vegetables. I would love to dress them up a bit with this recipe. Sounds yummy! Fresh green beans are always the way to go, even in a casserole. They just add a pop of freshness and a slight crunch that you can’t find in a can. Shh. Shhhh. You had me at bacon. Anytime you add crispy pig to anything, it’s going to be a winner. You just won best green bean recipe for the rest of my life. I totally understand that. I actually didn’t want to share these with my family……shhhhhh. Om nom nom nom. Way to make green beans amazing again! I can’t wait to make this. That looks delicious – just like everything else on your site! That’s not a side, that’s a complete meal.